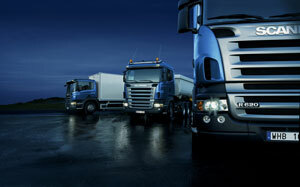 Scania is one of the world’s leading manufacturers of heavy trucks and buses. The company develops and manufactures trucks with a gross vehicle weight of more than 16 tonnes for long-haulage, construction haulage and regional and local distribution of goods. Its ambition is to meet the customers’ needs with the most optimum solutions for them. With Scania’s modular product system, the customer can get the exact vehicle specification he or she wants. The more closely a vehicle and related services are adapted to a transport task, the better the customer’s operating economy will be. The modular system is the basis for product quality. It also simplifies parts management and contributes to higher quality in the service organisation. Scania trucks have extremely high quality. They deliver the best total operating economy, long-term reliability and safety and constantly high levels of fuel economy. This leads to decrease of the overall running costs and increase of the residual value. Scania designs its products to have the lowest possible impact on the environment. They are optimized to consume less energy, raw materials and chemicals during their long life cycle. The efforts are directed to reducing the noxious gas emissions and preventing the use of hazardous substances when producing the trucks by checking the chemical content of the materials used. The Scania trucks meet all legal environmental requirements. Safety is the top priority for Scania trucks, as the attention is turned not only to the safety of the trucks: cab safety; safety systems, but also to the drivers’ training for road safety. Behind the Scania brand is a strong corporate culture and a high level of service and maintenance, covering the quality criteria of Scania according to DOS (Dealer Operating Standard) that always puts the customer first. Our customers feel proud to own and drive Scania trucks, but they also feel trust that they has made a sound investment, because they have chosen the most highly valued brand, which deservedly was defined as “THE KING OF THE ROAD”.